Lanell Bellows is confident his bumpy ride to the top will reach the final destination of his hand being raised in victory. 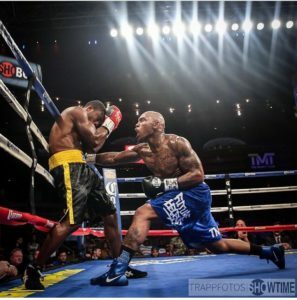 Lanell Bellows roller coaster boxing career continues this Friday as he’s still very hungry to rise in the rankings of the super middleweight division and inch closer towards title contention in the strong 168 pound ranks. His next step towards that journey is a matchup with Naim Terbunja (10-2, 1 KO) of Sweden at the Sam’s Town Hotel on May 11 in Las Vegas. Bellows(17-2-1, 10 KOs) is very aware that his next opponent has never been stopped and not only is he confident in handing Terbunja the third loss of his career, but he would also like to be the first to bless Terbunja with his first knockout loss this Friday. “His record (Terbuja) is (10-2) something like that, but its (10-3) come Friday,” Bellows said. “He hasn’t been stopped and it’ll be nice to bless him with a nice stoppage, since his career has been flawless as far as being stopped. “It’d be definitely a nice a little attribute to add under my belt and give me a nice notch, but a victory is good enough for me and it will happen on Friday,” he said. Despite a couple of setbacks in his career, Bellows is as hungry as ever and though he’s not specifically gunning for anybody at the top to fight, he will do whatever is necessary to get him closer to title contention and eventually get a shot at one of the four recognized straps in his division. “I have no names to call out in particular at this moment, but I definitely want positive progression to my career as far reaching and attaining a belt,” Bellows told me. “I definitely want to take any necessary steps that are going to get me to achieving that belt. I need it, I want it, I thirst for it, I hunger for it, I train for it. That’s my only thing on my to do list, to do whatever it takes to get me closer to getting that belt,” he said. Bellows didn’t always have this passion for the sport of boxing; there was a time in his life where he didn’t even think about becoming a professional prize fighter. But growing up in the rough streets of Cali, Bellows had to stay sharp with his hands as he had numerous street fights growing up that not only earned him his nickname “KO” Bellows, but made him realize he had a passion for fighting. “I was raised in Cali from Compton all the way to Palmdale. I fought in the streets a lot but I never really got into boxing,” Bellows said. “Me and my homeboys we used to put on the gloves and box in the street just to stay sharp, for any possible endeavors with any trouble, just trying to survive the Cali streets. “KO came from the streets, beating people up. I was knocking people out in the streets and it just got transferred over to boxing since that was already my name,” he said. Bellows was earning a living as a barber until one day he stumbled across a gym in Las Vegas and that’s where he decided he would pursue this endeavor in boxing. He would have 33 bouts in the unpaid ranks before eventually going pro. “I stumbled across a boxing gym when I was out here in Las Vegas. Professional wasn’t even in my plans, but I love to fight period,” Bellows told me. “As I got good, I almost qualified for the Olympic trials for the 2012 games and I was like ‘Well I done put all this time and energy and effort into it, maybe I can try and giving pro a shot and it worked out, thank god,” Bellows said. Just two fights into his professional career, Bellows got a rare opportunity as a young prospect to spar the considered best fighter in the world P4P at the time in Floyd Mayweather. Bellows showed no hesitation in entering the doghouse at the Mayweather boxing club or “stop at home” as Bellows would like to call it. They would spar a number of rounds much longer than the usual three minutes in duration and Mayweather came away impressed with the ability of Bellows, which prompted Mayweather to sign him to a promotional agreement not long after their sparring session. “From there it’s been going down in history, I was part of his Miguel Cotto camp and then I sign my contract a little bit later that year and I’m a TMT boxer and I’m here now,” Bellows said. The 32-year-old is no defensive boxer counterpuncher like his current promoter was in his heyday. Bellows considers himself to be a puncher boxer and likes to land devastating shots to his opponents that have produced some crushing knockouts in his career. In the two losses he’s received in the ring, Bellows has avenged one of those defeats and though he would like to avenge his split-decision loss to Decarlo Perez, there has to be an incentive for Bellows to fight him again, since Perez has since been stopped by Bellows teammate Ronald Gavril. “I definitely didn’t feel I lost that fight. I do want that fight back for my pride, but since he’s been knocked out by teammate Ronald Gavril. “At this point, it becomes pointless; it would become egotistical if I took the fight. It wouldn’t be career changing or career helping. Career wise it would do nothing for me,” Bellows explained. Bellows wants the fans that follow him that despite his road in reaching the top being a bumpy ride, he’s confident he will reach that final destination of his hand being raised in victory. “Follow me on facebook @Lanell Bellows or on twitter, snapchat, and instagram @KOBellows. And just follow me on my ride to the top, it’s a bumpy ride, strap your seatbelts up and enjoy the ride because it’s definitely going to be eventful. “It’s definitely going to be productive and it’s definitely going to get to the destination with our hands being raised,” Bellows said.